Sean Spicer’s eventful start to his role as White House press secretary continued on Wednesday, although for once, it wasn’t his fault that he was the centre of worldwide attention. The New England Patriots were in the White House on Wednesday (minus a few players who decided to skip the visit) following their Superbowl victory earlier this year and one of their biggest stars appeared to get a little lost while having a look around. 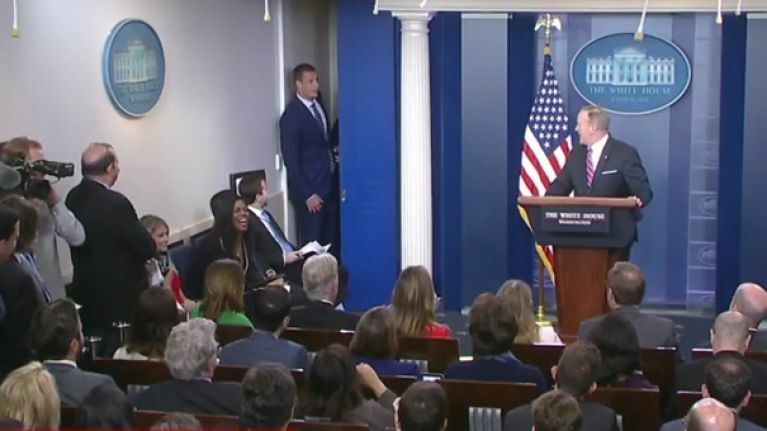 Given the way some of Spicer’s press briefings have gone of late, it’s no surprise that Gronk saw fit to offer some assistance and though his interruption was amusing, it had nothing on Melissa McCarthy’s vicious parody of the press secretary on Saturday Night Live at the weekend.